Have a pest problem on your hands? Whether you’ve woken up with bites, termites are threatening the foundation of your home or you’ve caught a mouse sneaking around your home, there’s nothing worse than the helplessness that a pest infestation can bring. At Pro Pest Bugs, we understand exactly how you feel, and our goal is to provide you with the right pest control solution for your needs, no matter how big or small your pest problem may be. What makes us your go-to pest control company in Sealy? Competitive Prices – As we mentioned, you’re already under enough stress when you have an infestation, and we don’t want to add to that stress with ridiculous rates. We keep our prices competitive because we believe that you deserve to work with the best pest control experts regardless of your budget. We can help you save even more with free estimates and pest inspections. Experience – Our technicians have been serving the good people of Sealy and the surrounding areas since 1999. With over 15 years of experience under our belts, we have what it takes to handle any and all pest problems that come our way. Local – As a locally owned and operating pest control business, we know the ins and outs of Texas, including the kinds of pests that live here, what kind of risk they pose to your health or your home and how to control infestations. Training – We are dedicated to ensuring that each and every member of our team is trained and ready to provide you with the high level of service that our customers have come to expect from Pro Pest Bugs over the years. Licensed and Insured – We are fully licensed and insured, giving you added peace of mind with every service we provide. Safe Treatments – Worried about exposing your children or pets to dangerous, chemical-laden pest control treatments? At Pro Pest Bugs, we provide pet-friendly and kid-friendly treatments. Warranty – If our experience, local technicians, safe treatments and insurance isn’t enough, we can provide you with even more peace of mind with our warranties. Every service we offer comes with a 30-day, 90-day or one-year warranty. When you rely on Pro Pest Bugs, you can rest easy in knowing that all of your pest control needs will be taken care of. Whether you have ants, bed bugs, wasps, mosquitoes, rodents, fleas, termites, spiders or almost any other pest problem, our team is ready and able to provide you with the safe solution that you’ve been looking for. We offer both spray treatments and perimeter treatments, but we only use spray treatments inside your home when absolutely necessary. Our perimeter pest control services can help to treat existing pest problems and prevent future pest problems, and we offer regular service at varying increments to keep your home or business pest-free all year. Monthly – Monthly pest control service is ideal for business and commercial buildings that cannot afford to allow pest problems to interrupt business. We also offer a monthly yard service for residential and commercial clients who have fleas and ants. Every Two Months – If you live in a rural area with lots of spiders, rodents and other pests, this every-two-months-service is ideal for you. Quarterly – Our quarterly service is ideal for people living in urban areas and city centers. 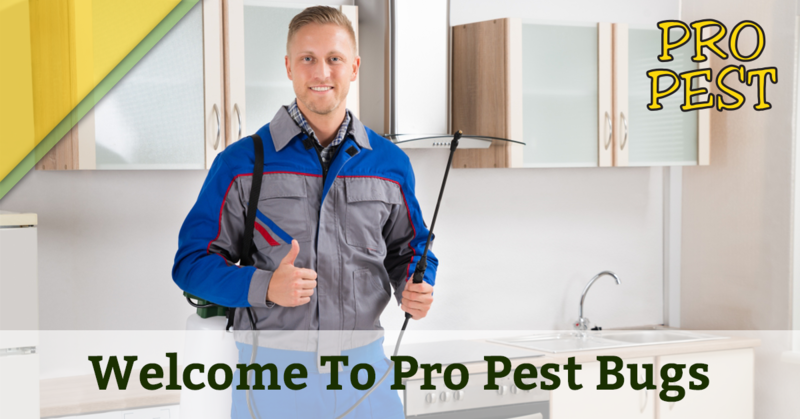 Know that you’re in good hands when you entrust your pest control needs to Pro Pest Bugs. Nothing is more stressful or makes you feel more helpless than a pest infestation in your home, and that’s why you should never leave your pest control needs up to just anyone. Our pest control experts are some of the best in the business, and we are dedicated to being there for you when you need us the most. Visit us online now to learn more and schedule your free pest inspection today.